Ideas for that awkward space above your kitchen cabinets | Your home, only better. I’ve been house hunting the past two months, and I’ve seen my fair share of awkward spaces over kitchen cabinets. But I’m going out on a limb here by saying that loading that space with accessories just because it’s there is a bad idea. If you’ve got high ceilings and a couple feet above the cabinets to work with, you have more options to create some interesting vignettes. But it should fit your design strategy – not just be filler. So I thumbed through my “inspiration folder” of kitchen ideas from my favorite design magazines. Nope, not a one showed filler up there. Rather, the cabinets in the designer kitchens either extended up (mostly) to the ceiling, or they allowed the space to breath. 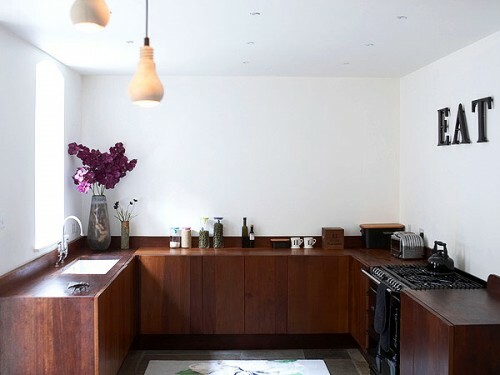 Minimize the color contrast between your cabinets and the wall above them. White cabinets work well with this strategy. Consider painting your cabinets so you have more options. It’s not a coincidence that many designer examples I found showed painted cabinets. 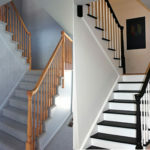 Add crown molding – the texture of the molding make the awkward space seems more intentional. 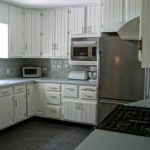 You can also extend the cabinets further upward with matching panels/molding. This example shows nice crown molding and a nice blend of wall color with cabinets. Very simple and it really finishes off the space. 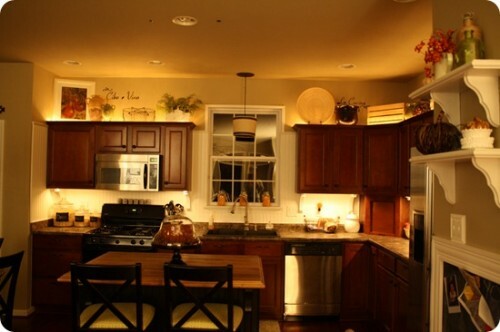 Add lighting that points up to add drama without clutter. Rope lighting is easy and adds a nice glow. 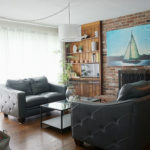 Shout out to Thrifty Décor Chic for her vision and fortitude! 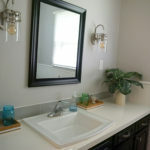 Note her smart use of vignettes – she has enough space to create nice arrangements. I especially like her use of vinyl lettering. Look…it’s George Clooney! (Just kidding). Create a focal point that distracts – colorful rug are an easy distractions. Other ideas: bright red bar stools, amazing chandelier, powerful artwork, etc. 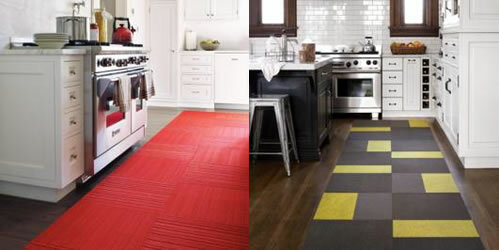 These examples are from FLOR – colorful carpet tiles create a wonderful focal point (and are very durable too!). 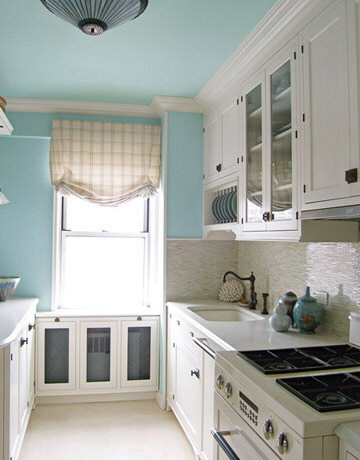 Paint the ceiling, or extend the paint color above the cabinet to the ceiling. Sky blue is an ideal choice for this strategy. This example shows a painted ceiling to compliment the cabinets, plus the painted island made a nice focal point. A very smart, fresh design. Friends don’t let friends use superfluous faux foliage of any kind “up there”. Why taunt dust? 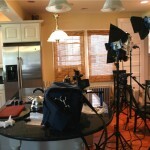 Hopefully you found a few ideas to help make your kitchen BETTER for you. 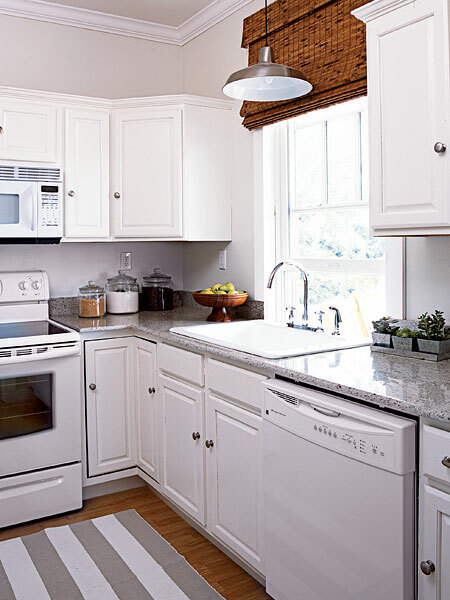 I’ll leave you with one last idea…you could just give up and go without any upper cabinets at all. Toast or tea anyone? I finally got around to implementing a quick fix to my own kitchen “up there” problem. 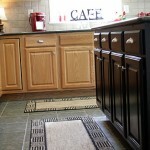 Check out My New-ish Kitchen post! 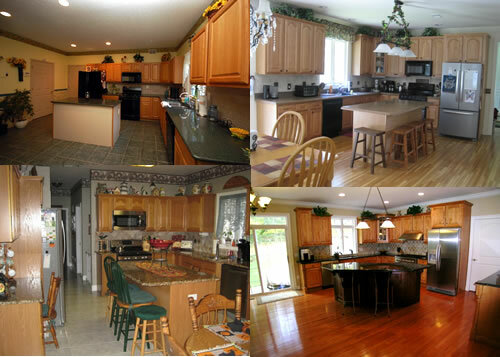 Hint – my kitchen is the top left pic in the first image in this post. Yikes! 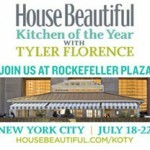 2011 House Beautiful Kitchen of the Year: Anticipation! Instead of in coffee cans, sorting situations work a a full lot preferable to carry things operated. bar foot rest? and is usually about 4-6 inches high? I used to know the name, but its been a good number of years, and I have forgotten. Thanks anyone who knows what I am referring to. No faux/fake plants – they are dust catchers and scream of a past decade century. I use the space for my Fiesta pitchers and bowls. I like to think they’re artfully arranged, but it is admittedly a little busy. Guess it’s time to “prune” the bowl collection. I’m wondering if it’s possible (or advisable) to retrofit 12″ cabinets with glass doors above my cabinets. 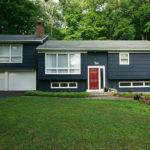 (They were barely a notch over builder grade for this 3200 SF home built 6 years ago.) I’m pretty sure I can find the same finish and design at one of the “big box” stores.) Has anyone attempted this? There is crown molding to remove but as far as I can tell, it should come down with minimal effort or “scars.” If that isn’t possible, what else can be done above the cabinets? (I’m dealing with 9 or 10 foot ceilings so there’s a lot of empty air space if I leave it empty.) I’ll take a pass on the no-upper-cabinets. I actually cook and USE all the dishes in my cabinets. I think the trend toward open shelves and no upper cabinets may look pretty but it’s not practical. Thanks for a good read! Dusty fake plants are such a disaster. I like the lighting idea! I love the lighting idea. I have one area above the cabinets I want to decorate. I took down the folage – yuk – it was gross! I have gathered all my platters that I have a hard time storing and want to enjoy. They are white or blue and white. In front of the yellow wall I think they will look nice. We will see! I collected baskets for cooking when I lived in Japan, but they are so difficult to store here. I display them above my cabinets and intersperse them with large pieces of my wedding china, like the soup tureen, turkey serving platter, and teapot. I don’t feel guilty about having them take up cabinet space and they are just so pretty to look at. Hi there. Found you through Struggling to be Stylish. I just did a post about ripping out the upper cabinets in an older home (showing what Pure Style Home did) unless the cabinets go all the way to the ceiling. I too cannot understand why you would waste space and put faux plants up there to get dusty. We actually bought mirrors from IKEA and mirrored that whole section. It reflects light, to make the kitchen not so dark. We just got rid of wallpaper and painted the walls a lighter shade. Once we do the cabinets, it should be a big change. Do you have a picture of the mirrored space? ! Love all your “above cabinet” ideas. That space is hard to deal with. Less or none at all is what I like. Ohmygosh NO cabinets up top? ahhh I’d die! Love the suggestions! Seriously, have you ever looked on top your cabinets? I hadn’t until I painted the wall behind them and OMG … nasty! I’ve seriously been considering building “display boxes” to go up there, taking off the existing molding in the top of the cabinets and replacing it with some kind of flat molding (to hide the seam between the boxes and the cabinets), putting crown on top and then lighting the crap out of it. But that sounds like so much work. So I just pretend I don’t see it. LOL – I couldn’t have said it any better…mocking is a great word for that. Thx for the chuckle (on my birthday, no less! ).